Talk to small business participants in the Chicago Anchors for a Strong Economy (CASE) training program and you’re likely to find that each can point to his or her own unique set of positive takeaways. For Kohl, the list of benefits goes on beyond the polish she learned to apply to sales pitches and presentations. Pre-CASE, she balked at approaching big government agencies such as the Chicago Housing Authority or wading through the 100-page contracts brimming with legalese that came with the territory. During another session, an anchor explained how the legal documents all followed a very similar format—and yes, there were ways to decode and decipher what they spelled out. Amy Van Howe says her family’s fuel and heating oil transport company, West Fuels, was well established when she first sat in on a CASE networking event in 2015. Based in LaGrange, Illinois, just to the west of Chicago, the business had a fleet of nine 18-wheelers—six with 8,000-gallon tanks and three with 4,500-gallon ones. Van Howe’s mother, Deborah, had launched the operation 25 years before under the tutelage of her grandfather, who had been in the heating oil business some 50 years. West Fuels had long targeted the Rush University Medical Center as a potential customer, but had gotten nowhere. The connections made at the CASE get-together proved to be the breakthrough West Fuels sought. At the beginning of the 2015–2016 heating season, Van Howe’s company landed a $15,000 quarterly contract with the medical center. Paul McKenna had run the Starship sandwich and soup restaurant in Chicago’s Forest Park neighborhood for over 30 years when he attended a free, three-day CASE seminar that centered on local food service businesses, an experience he says recharged his drive. McKenna came away from sessions led by anchor mentors with a keener eye for financial statements in addition to a new perspective on growth opportunities, particular in catering and event planning. Pre-CASE, McKenna says, Starship would handle perhaps 16 parties a year, and now with a sharper eye for marketing opportunities and networking, McKenna says the number has leapt to 10 a month. CASE launched in March 2014, spearheaded by Mayor Rahm Emanuel as part of a broader effort called World Business Chicago, which aims to promote business growth in the city. 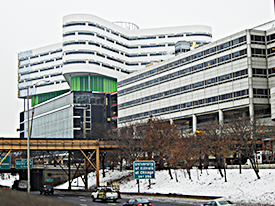 CASE’s main focus has been forming a bridge between big institutions such as universities, hospitals, and corporations headquartered in greater Chicagoland with small businesses also located in greater Chicago. (CASE counts anything within its seven-county regional footprint as “local.”) The end goal is for the big institutions—the anchors—to promote local economic growth in their city and their home neighborhoods by mentoring small company owners, but more importantly, by hammering out a procurement pipeline that allows them to direct more of what they spend to nearby vendors. CASE took off with an initial grant of $250,000 from the Polk Foundation, which to date has given $750,000 to the program. The program has made a difference for a number of business owners. Thanks to CASE, paving and snowplowing company CSI 3000, which Rey Rivera founded in 2010, was able to land contracts with ComEd, the University of Chicago, and the Chicago Housing Authority (CHA). In the case of Digby’s Detective and Security Agency, a 35-year-old company that employs 300 people, CASE opened the way for it to diversify its clientele, also with ComEd, the University of Chicago, and the CHA. Thanks to this growth, Digby’s took on 34 new hires, reports company President Lenita Digby Williams. As of August 2016, CASE has logged significant progress across its footprint. A total of 15 anchors have signed on, including municipal government agencies (the City of Chicago, Cook County, and the Chicago Transit and Housing authorities), colleges (Illinois Institute of Technology, the University of Chicago, and the University of Illinois at Chicago), hospitals (Rush University’s and Northwestern’s medical centers), and corporate members such as ComEd and BMO Harris Bank. CASE has assisted 219 businesses and helped create 92 new jobs, with additional ripple effects of its work to date expected to add an estimated 40 more in the next three years. Through CASE’s efforts, anchors have committed $46.7 million to local companies—$10 million of which has been paid, with the rest projected over the next few years. A 2015 survey the organization conducted shows that CASE is also having an effect on a number of targeted fronts such as bringing jobs to distressed Chicago neighborhoods like West Englewood, South Shore, and Roseland. The organization’s numbers indicate that 63 of 209 small companies that graduated from CASE’s training program were located in distressed parts of the metropolitan area. A total of 99 were owned by people of color, 38 of which were located in distressed neighborhoods. Also, 71 of the businesses that went through the program were owned by women, with 13 in distressed areas. Of 70 jobs that had been created through CASE contracts as of September 2015, 66 percent and 22 percent went to African-American and Hispanic employees, respectively. The survey found that 85 percent of the jobs were contracted hourly while 15 percent were salaried. The hourly wage jobs paid an average of $18.18 an hour, and the average salary for salaried positions was $55,100. Benefits were provided in 78 percent the jobs. Business owners invited into CASE’s programs attend three-day seminars or “cohort” meetings, where they sit down with the anchor’s procurement representatives and receive feedback on their strengths and shortcomings. In some cases, business owners who needed to sharpen their skills were directed to finance and administration classes with a nonprofit local business advisory, Next Street. But CASE is not merely a small business training program—it directs its focus to both the supply and demand sides as needed, sometimes making quick adjustments in that balance. Executive Director Nitika Nautiyal, who took charge of the organization in March 2015, says CASE has stepped up its efforts to identify ways small businesses can better serve the anchors, an initiative Nautiyal calls CASE’s “demand-side” focus. “Last year, we talked about becoming more strategic and as a result started looking at demand quantitatively—what do anchors buy, what they are not buying locally—in other words, treating them as our very own clients,” she says. Using this information, CASE has nudged anchors to shift their thinking. Nautiyal reports that CASE recently launched an “anchor scorecard” to get feedback from anchor participants to see if they have adopted CASE-recommended policy changes to make it easier for small businesses to bid on contracts and if so, how well they have worked. To date, Nautiyal says several anchors have added new posts or roles responsible for diversifying their supplier rolls. Others have added specific language to underscore their commitment to hiring locally in invitations for bidding on contracts for food and facilities management, for instance. CASE keeps a close eye on the data, and as a result the fairly young organization has already modified its course on several occasions. For example, early in 2015, the organization noticed it was fielding roughly 5 to 10 queries a month from anchors who were searching for businesses that could bid on specific projects. This year, queries involved needs such as 24-hour appliance repair to sign making and signage maintenance, healthy-snack vending machines, and assistance with patient financial services in hospitals. Once anchors receive a list of CASE suppliers, they reach out directly to company owners to break the ice and even encourage a bid. With a healthy set of suppliers available, CASE wanted to increase this demand so it began to focus more on what anchors needed. One thing became clear: Most anchors had supplier diversity goals in place. “In some cases we found that anchors had put diversity as a greater priority than local spending,” says Nautiyal. “Some were relying on East or West Coast suppliers to meet their targets. So when we talked about realigning our focus to support anchors more, it was clear that diversity was our friend.” CASE was in a position to help—Nautiyal estimates that 60 percent to 70 percent of the small businesses that have joined the CASE supplier list are women- or minority-owned. Working this angle seems to have already paid dividends: Since the beginning of 2016, CASE has seen the number of monthly queries rise to an average of 15 to 18; roughly 95 percent of the organization’s success stories are women- and/or minority-owned businesses. Once the interview and review of financials is done, CASE recruits will be scored on how ready they are to enter contracts. Companies that make the cutoff will be marked as “graduates” in the organization’s supplier list and have the opportunity to attend conferences and networking events with anchors. To help applicants who come up a bit short of expectations, CASE has now partnered with Goldman Sachs 10,000 Small Businesses program, which will conduct the training and classes needed to get owners up to speed and ready to join the graduate list. Graduates who would like supplemental business training are free to sign up as well. CASE realized that its previous training programs overlapped with the Goldman Sachs’ curriculum, Nautiyal says, so it was more efficient to partner rather than duplicate. Perhaps the biggest hurdle for CASE small company participants is ramping up scale to be at the ready any time anchors open bidding. “There have been times when companies [that] are great businesses on their own aren’t entirely ready for the complexity of working with an anchor,” says Nautiyal. “Each anchor has its own expectations or its schedule and procedures for payment or delivery. And finally, each anchor is going to hold our companies up to see if they’re as good [as], if not better than their current supplier.” CASE is taking these lessons into account as it refines its training. Douglas says CASE spurred both the University of Chicago and its hospital to take steps to systematically invest more in local businesses, including those that provide food service, printing, medical supplies, and even moving services, in addition to boosting hiring within the surrounding neighborhoods. Two examples are medical and office supply companies Supply Logistics & Procurement and Inter-City Supply, which are located a mere 6 and 4 miles away from the campus, respectively. Both certified minority-owned firms entered CASE in its inaugural year and now have five- and six-figure standing contracts with the University of Chicago Medical Center.